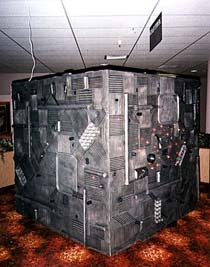 I made the six-foot Borg cube out of paper sides stapled to the pine wood frame inside. For the mechanically "assmiliated" look, I had all my friends and family save me their interesting garbage for possible use. (I do admit that the most obscure items did come from my own stash, however...) I also used three THOUSAND clear plastic drinking straws for the main design, along with many toiletpaper, paper towel and wrapping paper tubes. An amazing amount of empty film canisters and their lids also made it onto the cube. After hot gluing the various items to the paper, I then spray-painted everything black (using 15 cans of spray paint, no less!). 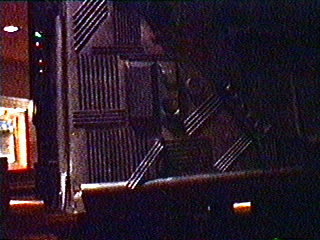 For the dark, gloomy metallic effect, I used one can of silver spray paint to highlight the texture of all the "assmiliated" objects. Since I felt this display needed some movement, I also put blinking Christmas lights inside the cube, poking only the lights themselves through the paper so the wires would not show. 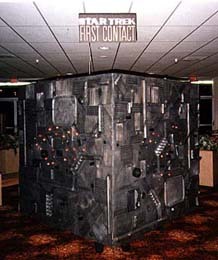 The final effect was to support the cube on children's booster seats so it seemed to be slightly hovering over the floor.